Luke Frishkoff, University of Texas at Arlington assistant professor of biology, explores how human land use expedites biodiversity loss in a paper recently published in Nature Ecology & Evolution. 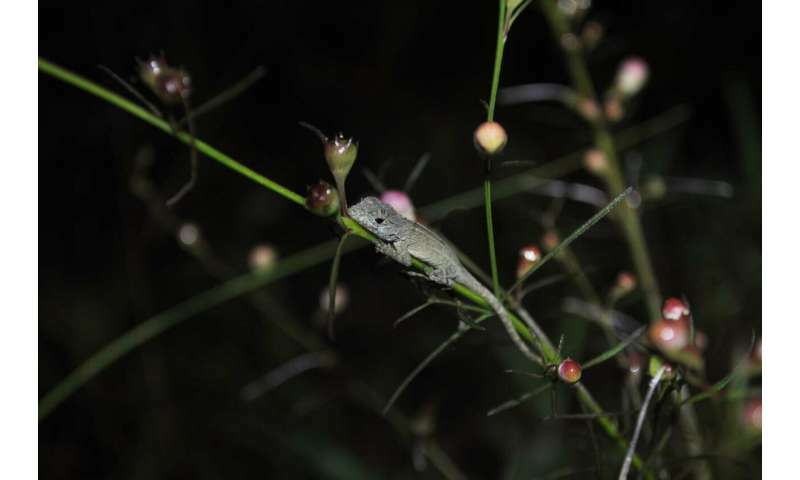 For a study conducted at the University of Toronto, Frishkoff, as a postdoctoral fellow, and his collaborators traveled to the Dominican Republic to take a census of the region's Anolis lizard species along an elevation gradient affected by deforestation. The species is a common group of tropical lizards that are a model system in ecology and evolutionary biology. "This work uses elevation as a lens to understand the potential implications of climate change," Frishkoff said. "Temperature changes along an elevation gradient, and general climate temperatures are expected to continue warming. By comparing the highlands to the lowlands, we can, in some sense, get a picture of how these biological communities might look in the future." The lowlands along the gradient are warmer than the highlands due to altitude, and a forest canopy blocks direct sunlight making the vegetation-dense areas cooler than their agricultural surroundings at any elevation. The study determined elevation plays a major role in which species survive as humans modify the habitat. "The takeaway message is that the lizard communities in the lowlands are pretty good at coping with habitat conversion—they lose abundance, but don't go extinct," Frishkoff said. "When the forest is cut down in the highlands and the habitat warms, the pastures become filled with species from the warmer lowlands. Unlike the lowland species, the locally adapted forest lizards unique to the region's mountaintops cannot survive when the forest is cut down." Frishkoff points out that biodiverse animals in any habitat act as "ecological players" to balance the ecosystem and often provide services that benefit humans in a variety of different ways. In order to get the most benefit from these ecological players, humans need to understand and have mechanisms to predict which species will survive as the climate warms and human land use changes, and Frishkoff's research indicates the effects of habitat conversion can change radically with elevation. The Dominican Republic study is part of a larger project, Frishkoff said. Since coming to UTA in September 2018, he has begun looking at lizard populations throughout Jamaica, Puerto Rico, Central America and Texas to understand the rules that govern species survival in a variety of different climates and conditions. "We need to be able to predict what species are going to do well in what environmental contexts," Frishkoff said. "The broader goal is to lay that foundation to predict biological communities across climates, across land uses. So that eventually policymakers can use that information eventually to make decisions that integrate human wellbeing and biological wellbeing." In his research, Frishkoff focuses mainly on reptiles and amphibians. He said the placement of UTA offers a great wealth of biological diversity to support his research, which is enriched by the university's Amphibian and Reptile Diversity Research Center. The ARDRC is home to the largest herpetology collection in Texas with more than 200,000 specimens. Using the collection, Frishkoff's lab is beginning to study morphological differences between species to understand whether certain body shapes allow various species to do better in urban environments like the one UTA lies at the center of. "Luke's ongoing and developing research endeavors to address critical issues facing our global environment and support a sustainable urban community—two driving themes of our university's strategic plan," said Clay Clark, professor and chair of the Department of Biology. "He will make contributions to our growing footprint as a research enterprise."